le chaudron de vulcain – October 12 , 2018. EN. La Réunion : Piton de la Fournaise , Colombia : Nevado del Ruiz , Papua New Guinea : Manam , Ecuador / Galapagos : Sierra Negra . Home / blog georges Vitton / October 12 , 2018. EN. La Réunion : Piton de la Fournaise , Colombia : Nevado del Ruiz , Papua New Guinea : Manam , Ecuador / Galapagos : Sierra Negra . Activity Bulletin from Thursday, October 11, 2018 at 3:00 pm (local time). The eruption started on September 15th at 4:25 am local time continues. The intensity of the volcanic tremor (indicator of eruptive intensity at the surface) is still gradually decreasing since six days, even if this decline has slowed down since 48h (Figure 1). – No volcano-tectonic earthquake was recorded during the day of October 10, nor during the current day. – Inflation (swelling) of the building is always recorded. This inflation is accompanied by an increase in the concentrations of CO2 in the soil in the area of ​​the Volcano Cottage. This inflation reflects the pressurization of a localized source beneath the summit craters (Bory-Dolomieu) at a depth of 1-1.5 km, related to the recharge of the superficial reservoir by deeper magma. – The surface flows could not be estimated today because of lava flows that are too weak at the surface and the cloud cover present on site. 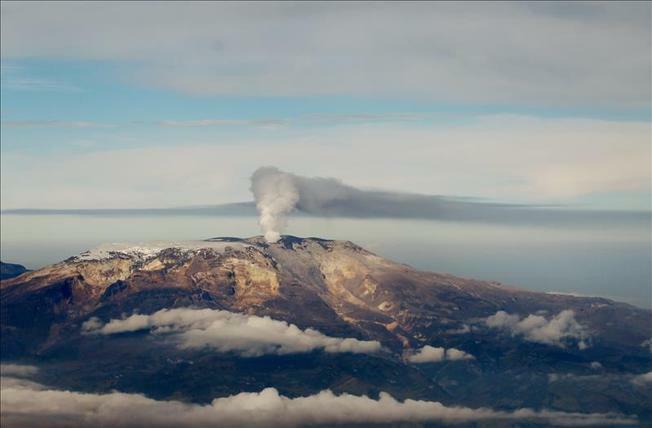 – No reconnaissance of the terrain could be done today given the bad weather conditions on the volcano this morning, and the cloud cover on the flow front this afternoon. If the weather conditions allow a reconnaissance and a sampling of lava at the front of flow is expected tomorrow Friday by a team of the OVPF. These samples will then be sent as soon as possible to metropolitan France for analysis to see if the magma accumulating in the reservoir for almost two weeks now is already coming out or if it continues to accumulate in depth, with in this case a possible risk of opening new cracks. 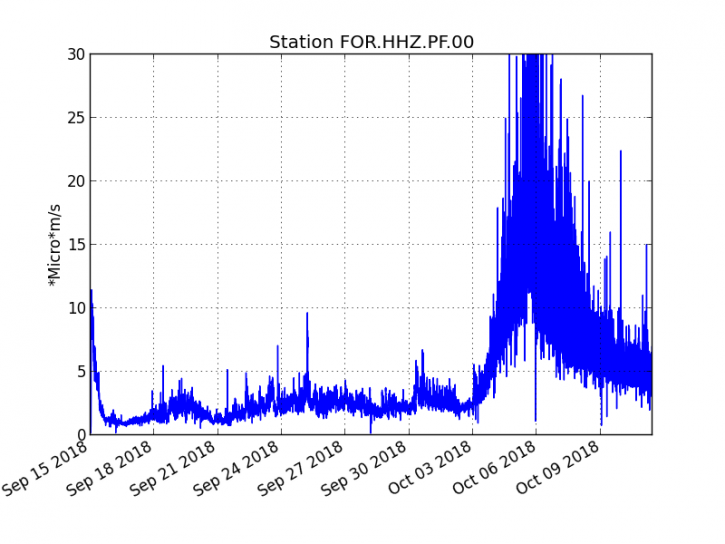 During the past week, the seismicity caused by the fracturing of the rocks that make up the volcano has resulted in a slight increase in the number of earthquakes and a decrease in seismic energy levels released compared to the previous week. The earthquakes were mainly located in the areas south, southeast and north-east of the Arenas crater, at depths between 0.4 and 6.9 km. The maximum magnitude recorded during the week was 1.0 ML (local magnitude) corresponding to the earthquake on October 05 at 12:44 (local time), located 2.2 km south of the crater Arenas and at a depth of 3 , 4 km. Seismicity related to fluid dynamics, within the channels of the volcanic structure, showed an increase in the number of earthquakes and released seismic energy compared to the previous week. This activity was characterized by the presence of earthquakes at variable energy levels, of long period type, very long period and pulses of volcanic tremor. The earthquakes were mainly located in the crater Arenas and its surroundings. Some of these seismic signals were associated with lower emissions of gas and ash into the atmosphere, as confirmed by the images captured by the cameras installed in the volcano area. The volcano continues to emit into the atmosphere water vapor, ash and gases, among which is the sulfur dioxide (SO2). During the week, the MIROVA portal reported several thermal anomalies of low energy level. 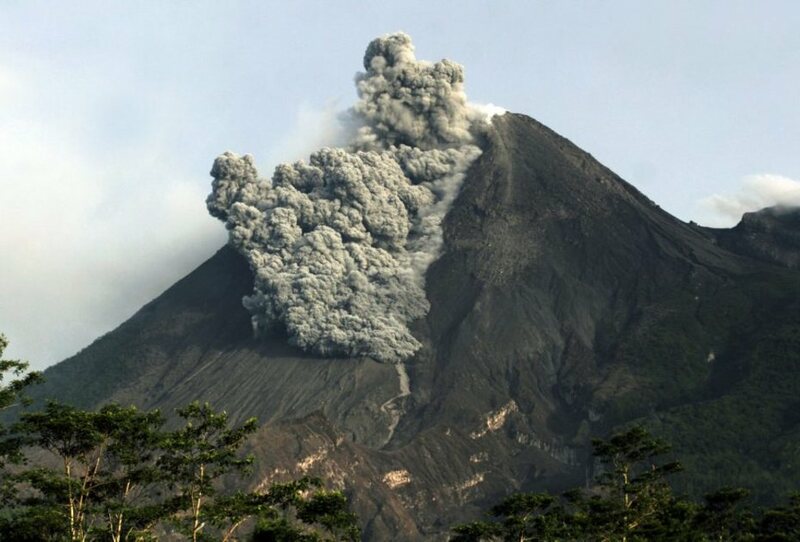 The column of gas, steam and ash reached a maximum height of 1,800 m, measured at the top of the volcano on October 6. 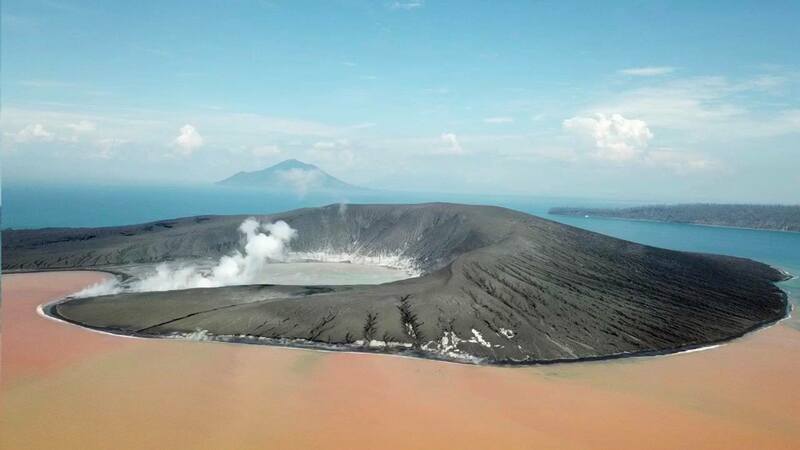 The volcano on Papua New Guinea‘s Manam Island has erupted again. Manam, which lies off the coast of Madang Province, is one of PNG‘s most active volcanoes, last erupting in April 2017. The eruption started in the early hours of this morning, and villagers there have reported thick ashfall and flashes of lava from the summit. Sunlight has been blocked for much of the day. A resident told PNG Loop that some of the island‘s people are planning to evacuate to the mainland. In 2004, a major eruption forced the evacuation of some 9,000 people from the island. Many of them still reside at a camp on the outskirts of Madang. 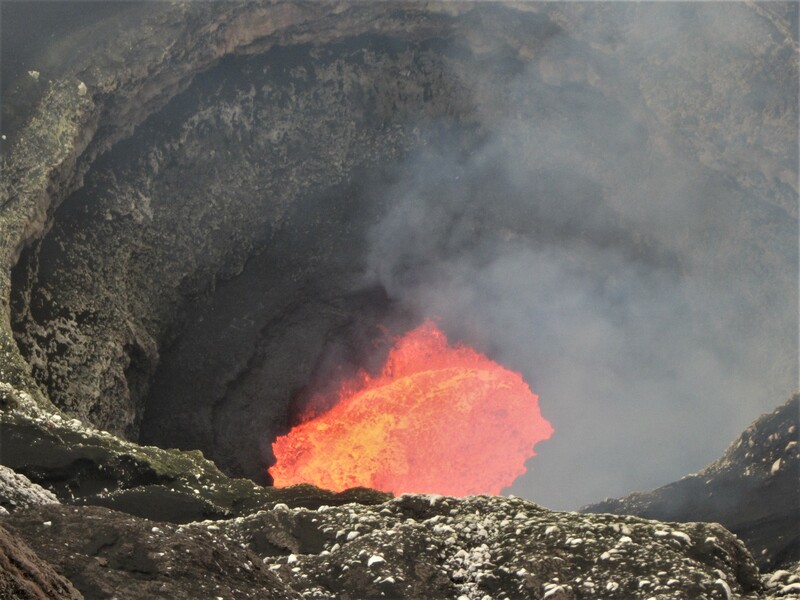 RVO reported that on 1 October field observations after an eruption at Manam confirmed lava flows in the NE valley. 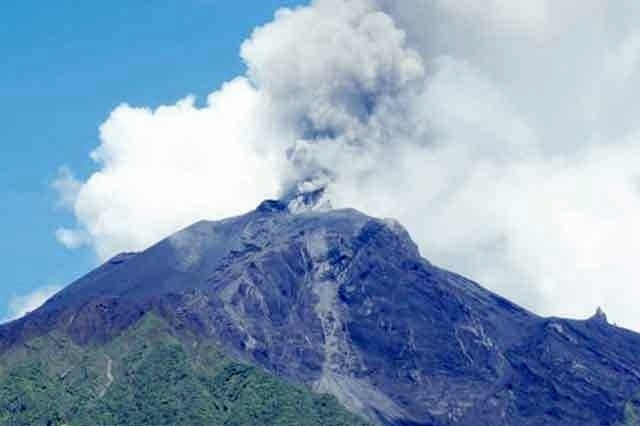 There were two lava flow lobes, both stopping before inhabited areas; the smaller lobe flowed on the N side of the valley towards Koland Village and the larger flowed on the S side towards Boakure Village. Effects from ash and scoria fallout on the NW and NW sides of the island were minor. Based on analyses of satellite imagery and wind model data, the Darwin VAAC reported that on 3 October an ash plume rose 2.1 km (7,000 ft) a.s.l. and drifted NW. A thermal anomaly was also visible. Source : Katie Hansen le 11 octobre 2018 à 06h30. Zeeland press. GVP. 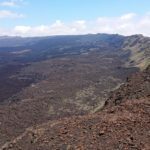 Campaign of gravimetric measurements, geochemical sampling and geological works associated with the recent eruptive process of the Sierra Negra volcano. The Sierra Negra volcano on Isla Isabela, in the Galapagos province, is located 23 km southeast of the center of Puerto Villamil. On June 26, 2018, a new eruptive process began and its activity was maintained until mid-August of this year, with the emission of lava flows oriented mainly towards the North. Fig. 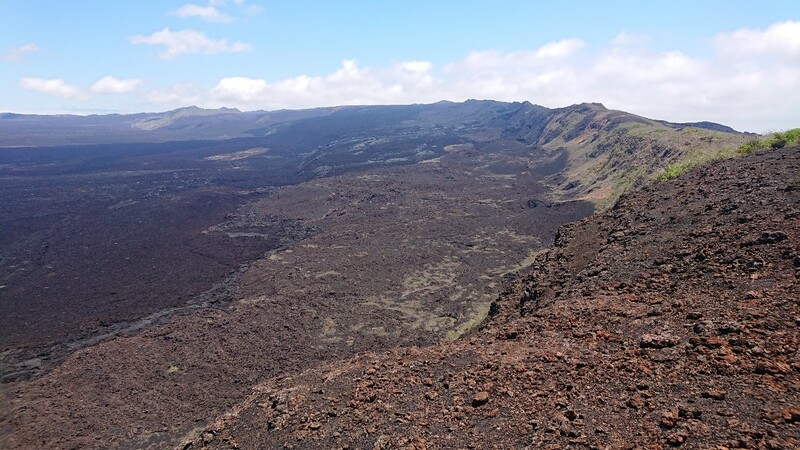 1: The north-east part of the caldera of Sierra Negra volcano, with the lavas emitted during the eruptive process of 2005 and the new lavas emitted during the 2018 process. Looking north. 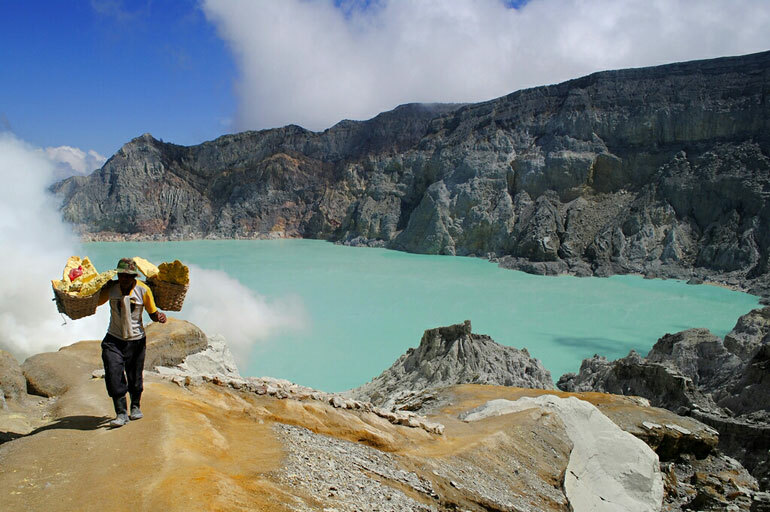 The vertical distance between the bottom of the caldera and the edge is 100 meters. (Photographs: E. Telenchana IG-EPN). From August 31 to September 10, 2018, technicians from the Institute of Geophysics of the National Polytechnic School (IG-EPN) conducted a monitoring campaign with Scintrex CG-5 microgravimeter, geochemical sampling and geological work related to the eruptive process of the Sierra Negra volcano. The campaign in and around the volcano caldera consisted of several measuring points on the north, northeast, east and southwest flanks. The objective was to measure the local gravitational field, associated with the eruptive process of the volcano. 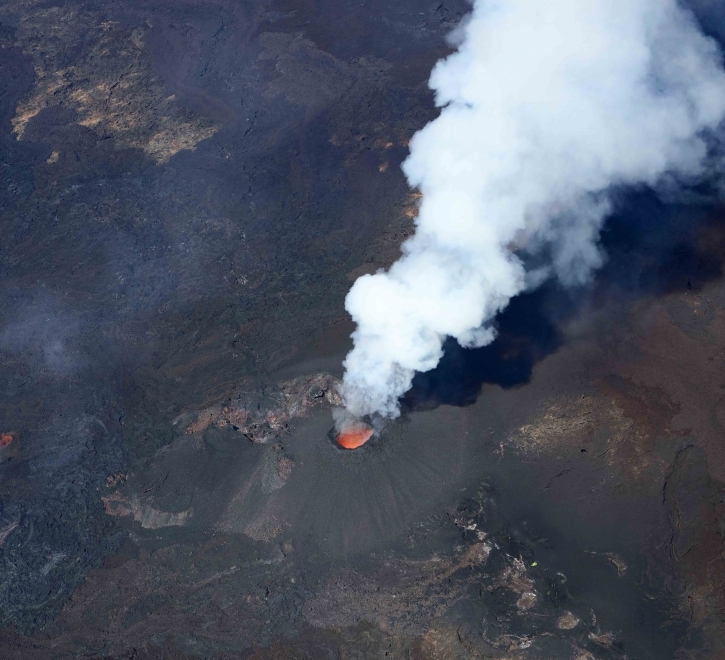 Using the microgravimeter, we can perceive the minute variations of gravity associated with mass changes produced during the eruptive process of a volcano. 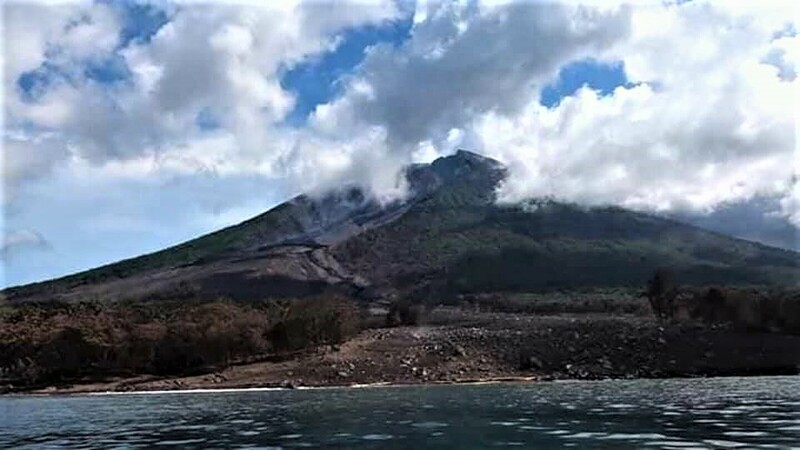 During the campaign, 7 recognitions were made, 4 in the north-east of the volcano, 3 in the southwest and one inside the caldera, with a total of 42 measuring points. Fig. 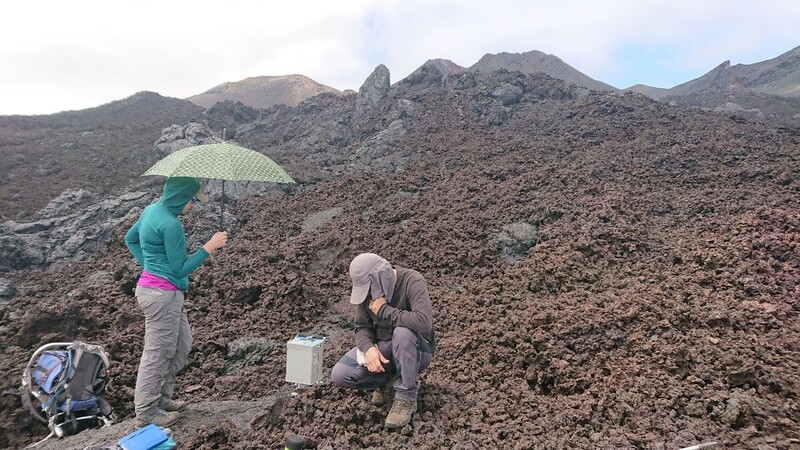 2: Geophysical Institute staff performing micro-gravimeter measurement on the northeast flank of Sierra Negra volcano (Photo: E. Telenchana IG-EPN). On the other hand, in the southwestern part, temperature measurements were made by means of a thermocouple in the « Minas de Azufre » fumaroles with a maximum value of 160 ° C. In addition, a sampling of the gases emitted by these fumaroles and a measurement of the amount of gas with FLYSPEC were also performed. Figure 3. Sampling of gases from fumaroles of « Minas de Azufre » located in the southwestern part of Sierra Negra volcano (Photos: Klever guard of PNG park). Figure 4. 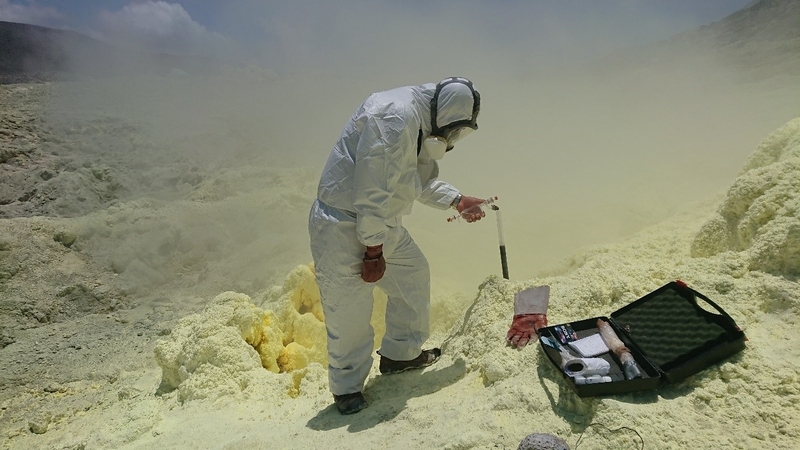 Taking micro-gravimetric measurements and amount of gas discharged through « Sulfur Mines » orifices, located in the southwestern part of Sierra Negra volcano FLYSPEC (photos: F. Mejia IG-EPN). Finally, geological work was carried out on the cracks associated with the first phase of the eruptive process which began on June 26th. Several emission points were located where the lava flowed down the caldera flanks, mainly towards the north side; some of these areas also have gas emissions and sulfur precipitation. 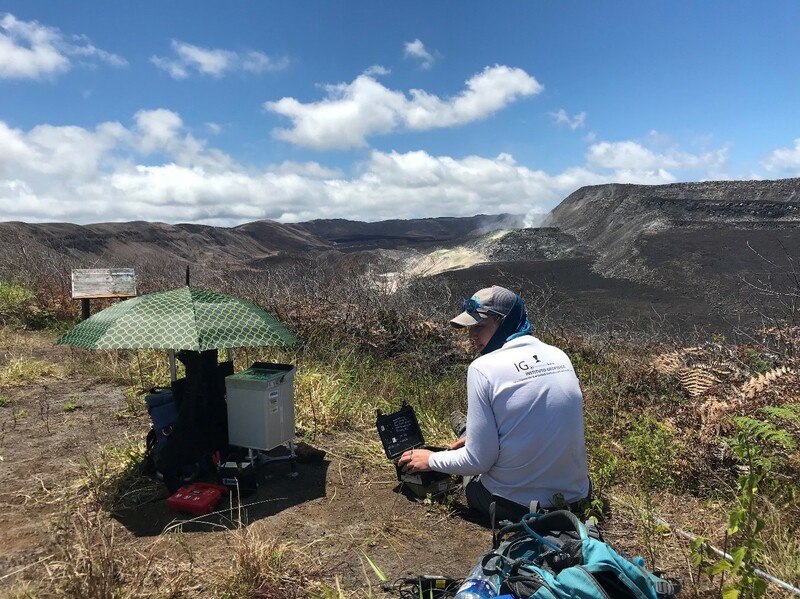 In addition, several samples of recent lava flows have been taken, these samples will be used later for chemical analysis in the laboratory of the Institute of Geophysics of the National Polytechnic, and thus will allow to know its chemical composition and other research data. Figure 5. Samples of lava flows from the Sierra Negra volcano during the first phase of its eruptive process (Photo: E. Telenchana IG-EPN). 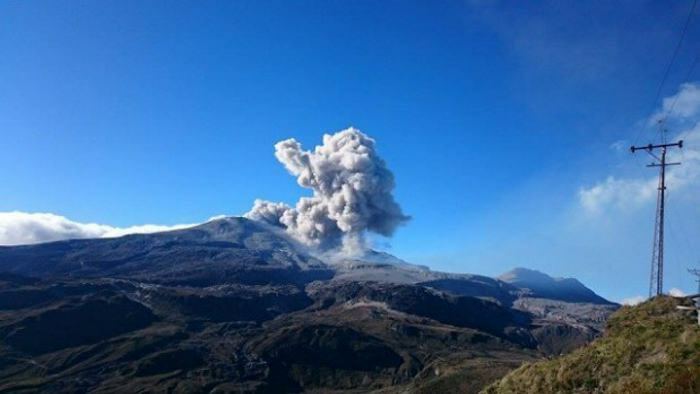 The Institute of Geophysics of the National Polytechnic School provides permanent monitoring of the volcanic activity of the Sierra Negra volcano and will inform any anomalies. Source : ET,EG,FM , Instituto Geofísico , Escuela Politécnica Nacional , IGEPN.